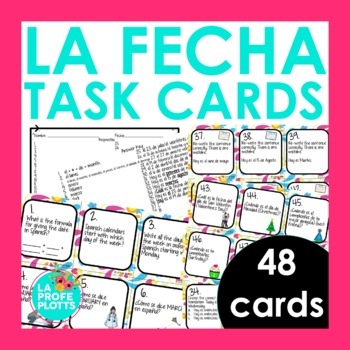 This Spanish days, months, and dates task card set has 48 different cards to get your students up and moving while getting a well-rounded review of los días, los meses y las fechas. Students will be engaged as they complete various tasks on the included response sheet like writing all the days of the week in order, translating months from English to Spanish, writing dates in Spanish, re-writing grammatically-incorrect sentences correctly, answering multiple choice questions, and responding to questions with short answers. 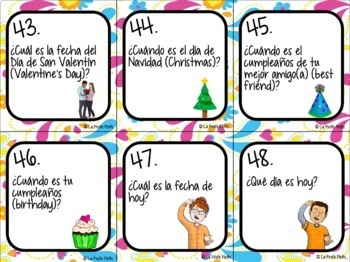 This set is included in my Spanish Task Cards MEGA Bundle which includes ALL of my task card sets. Save 25% off the list price when you buy the GROWING bundle! Click the link to see it! 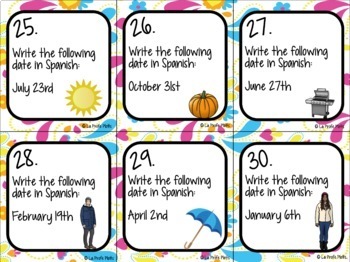 Need another engaging activity to help your students learn days, months, and dates in Spanish? 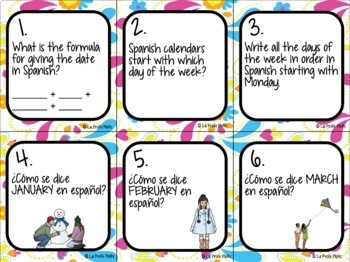 Check out the super fun Spanish Days, Months, and Dates Jeopardy-Style Trivia Game!